(MODEL RELEASED IMAGE). 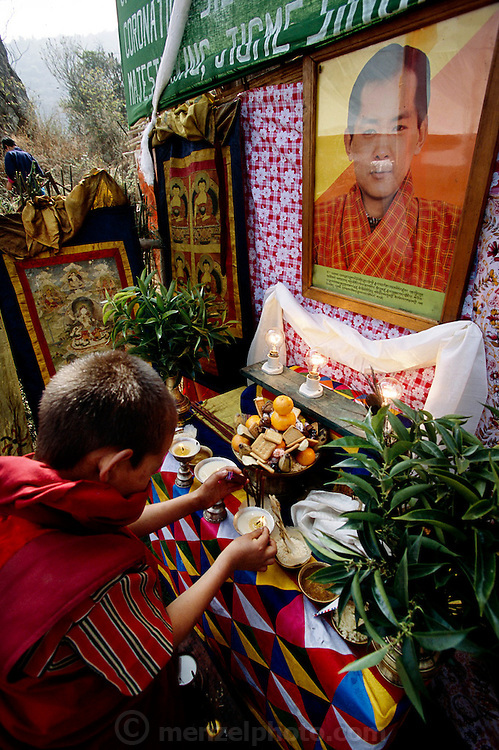 As part of the celebration that marks the first electricity to come to this region of Bhutan, Chato Namgay (in red robe) lights the ritual butter lamps on an altar below the transformer on the power pole. Above a photo of the king, a sign reads: "Release of Power Supply to Rural Households Under Wangdi Phodrang Dzon Khag to Commemorate Coronation Silver Jubilee Celebration of His Majesty, King Jigme Singye Wangchuk." (Supporting image from the project Hungry Planet: What the World Eats.) The Namgay family living in the remote mountain village of Shingkhey, Bhutan, is one of the thirty families featured, with a weeks' worth of food, in the book Hungry Planet: What the World Eats.